As with any "best of" opinion, I think there should be some explanation and some qualifiers. This is my opinion. You may or may not agree with me. That's okay. There are many fine options available, and there are many people out there who are totally satisfied with a different choice. This is just the best built-in grill in my opinion, and this is the one I would buy if I was in the market and if it fit my budget. Performance This is the most important consideration. After all, this can't be the best built-in grill if it doesn't do the things a good grill should do, and do them very well. Appearance The best built-in grill should look great as well as perform well. 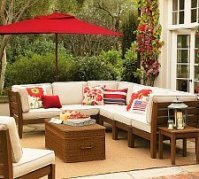 It should enhance the look of your outdoor kitchen or BBQ Island. You should feel proud of it not only when you cook on it, but when you walk by it. 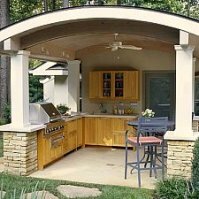 Durability You are going to spend some serious money on this part of your outdoor kitchen. This is going to be a centerpiece of the overall design. For the money spent, the best built-in grill should hold up well to the elements as well as to frequent use. A strong warranty says the manufacturer is confident that you won't have any problems. Value You should expect to pay more for quality, but that doesn't mean you should expect to throw money away. I look for high quality at a reasonable price. Many built-in grills are available as cart models as well. The grill is identical, its just mounted in a cart rather than being ready to install in a cabinet. (see photo near bottom of page) The cooking will be the same either way, but the $1500 to $1800 you will pay on average for a high quality stainless steel cart will go a long way towards a cabinet in your outdoor kitchen. No, you can't build an entire outdoor kitchen for that amount. But depending upon materials, size and style, you can build a decent custom cabinet for your built-in grill for about the same cost. Drum roll please.... Based on the above criteria, I chose the DCS model BGB36-BQAR-N. DCS is made by Fisher & Paykel and is known for high quality manufacturing and innovation. This 36 inch grill is advanced, but remains simplistic in its design. Similar in that way to the Weber E-320 (reviewed in Best Grill under $1000) this DCS grill adheres to the "simple is best" policy. It does its job very, very well without worrying about extraneous bells and whistles. But the DCS BGB36 is far from plain. If I was trying to sell you something, I'd wait until the end of this piece to give you the price. But I'm not selling anything, so here's what you really want to know anyway. The DCS BGB36 sells for about $3500. Yes, that's a lot of money for a grill, but it's actually a mid level price for a high end, high quality built-in grill. You may find a built-in grill for $1500 less than this, and I know you can spend over $2000 more than this. If you spend less, you'll get less. Not necessarily so if you spend more. I assure you that I would use that extra $2000 to add something else to my outdoor kitchen. Remember my "value" criteria above? This is where that figures in. Okay, now you know how much it'll cost you. Let's see what you get for that money. The DCS BGB36 is built with top grade 304 stainless steel, as would be expected at this price point. 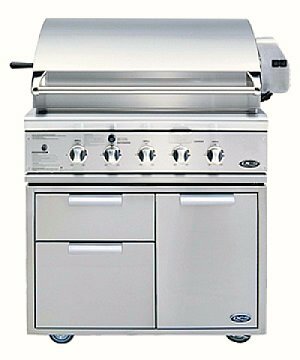 This 36 inch grill has an ample 638 square inches of cooking surface and utilizes three 25,ooo BTU burners. Both the burners and the cooking grids are made of stainless steel. The U-shaped burners can be staggered for indirect or direct heating. An additional 14,000 BTU rear burner provides cooking heat for the rotisserie. The heavy duty rotisserie kit can handle up to 25 pounds of meat for slow roasting. 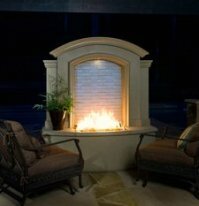 You will also find a removable warming rack with 241 square inches of space. Okay, I know I said the DCS BGB36 was simple, and that is true. But that doesn't mean it lacks innovation - in fact, that's what makes it stand out. It has a small slide-out smoker tray with its own 3,500 BTU burner. Just put the soaked wood chips in the tray and slide it back into place - fire up the burner and the flavorful smoke goes to work! Simple, but a very useful and practical feature. DCS has developed a grease management system for its line of grills. Again, nothing complicated, but effective. The cooking grids are sloped and a series of channels take advantage of gravity to cause the grease to flow down into a grease tray. The objective is to eliminate, or to greatly reduce, flare ups. Another simple solution to a common problem. One of the coolest features on the DCS BGB36 is the use of their patented ceramic cooking rods rather than the briquette shaped pieces we are all used to seeing. A radiant unit holds a series of ceramic rods in pace over the heat. These rods absord and then radiate the heat evenly over the cooking surface. When the get dirty, just rotate them and let the heat from those big burners clean them off. Again, simple, neat, and effective. The cooking grates themselves are another innovative design feature from DCS. The grates are reversible, and have a different style of surface on each side. One side is great for steaks, burgers, chicken...all of the standard items we all love to grill. This side is shaped like a "W" and leaves a nice sear line while keeping grease and fat away from the meat. The other side is rounded and is more suitable for fish, scallops, small vegetables, and more delicate grilling items. Just another simple but effective and well thought out feature. Finally, if there aren't enough cool things for you yet, you'll even get a 50 watt grilling light built into the DCS BGB36. Actually, that comes in quite handy when cooking at night, as the light is often behind you and is therefore blocked by your shadow. You can tell a lot about the quality of a product by the warranty that the manufacturer puts behind it. DCS provides a very strong warranty for its products. For one year, they cover parts and labor for your grill. Not only that, in the Unietd States (except Alaska) and Canada, they will come to your house to fix it. Beat that! After that, they offer a limited lifetime warranty on parts including a full five years on the burners, radiant assemblies, and drip pans. They include a lifetime warranty on all of the stainless steel components. If the grill wasn't well made, they couldn't afford this kind of warranty. You'll be buying peace of mind when you invest in this grill. Again, there is a great deal of subjectivity that comes with any "best of" determination. Sure, there is plenty of room for differences of opinion. But you will not regret your investment with this grill. So hurry up and get grillin'!